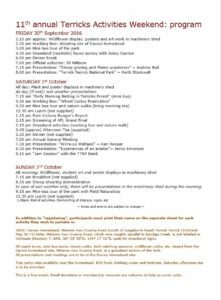 The big three day event we have been waiting all year for. 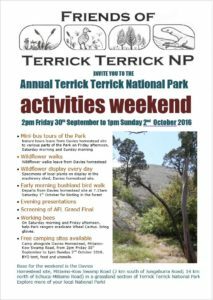 Friends of Terrick Terrick National Park invite you to their annual activities weekend at the park. Free camp sites available near the homestead. BYO food, drinking water and tent/van. Saturday afternoon tea is to be provided. This is a free event. Small donations or membership renewals are welcome to help us cover costs.